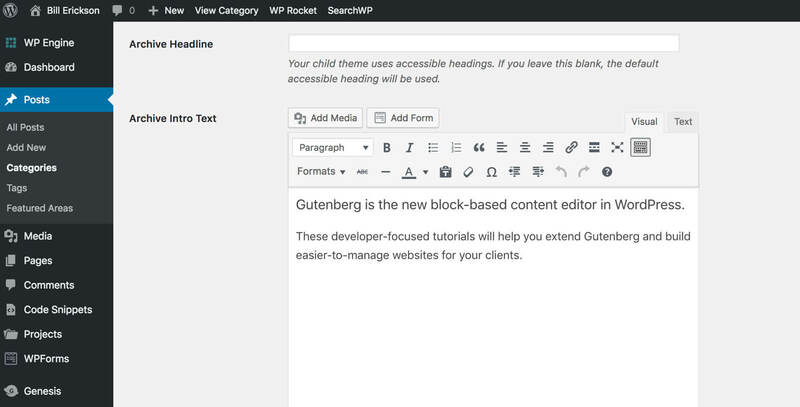 The Genesis theme framework includes an Archive Settings box for specifying the page title and introductory content for category and author archives. Take a look at my Gutenberg category archive as an example. When registering your own custom post types, you can enable this same functionality by including 'genesis-cpt-archives-settings' in the supports array. For more information, see my article on creating custom post types. What if you’re not the one registering the custom post type? In these situations, you can use add_post_type_support(). Here’s how to add support to an event post type registered by another plugin. Place the code in your Core Functionality plugin or your theme’s functions.php file.